We are excited to announce our 2016 exhibition, curated by noted scholar Annette Blaugrund with the assistance of our associate curator Kate Menconeri, opening May 1, 2016 and on view through October 30, 2016. In celebration of the recreation of Thomas Cole’s self-designed Italianate studio at the Thomas Cole National Historic Site, the exhibition and the accompanying book focus on Cole’s architectural interests through architectural elements in his paintings and drawings as well as in both his realized and visionary projects, expanding our understanding of the breadth of his talents and interests. This exhibition is the inaugural exhibition to be held in the “New Studio” building and will include 26 paintings and drawings, as well as a scale model, two of the artist’s books about architecture, and primary source documents. 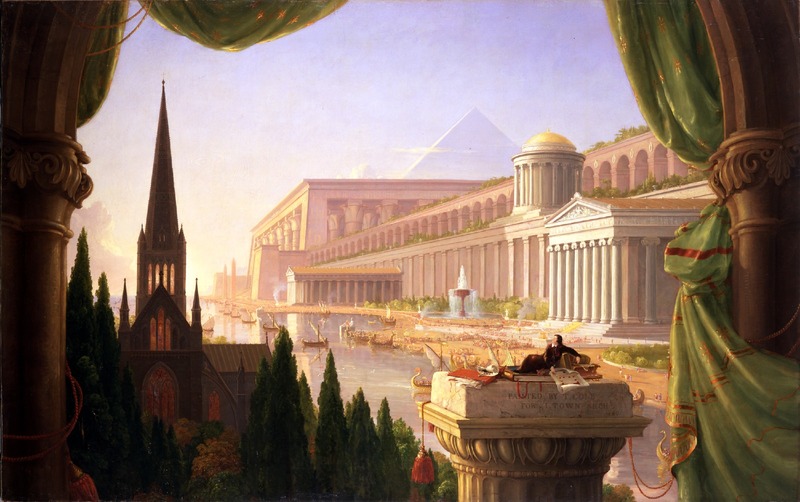 The central work of the exhibition is Cole’s 1840 painting “The Architect’s Dream,” depicting the artist overlooking a panorama of architectural styles. Accompanying the exhibition will be a new hardcover book of the same title to be published and released on April 19, 2016 by The Monacelli Press. The exhibition will run from May 1 through October 30 at The Thomas Cole National Historic Site and then travel to The Columbus Museum of Art, where it will be on view from November 18 through February 12, 2017. Click here for the full press release. The exhibition is supported in part by the National Endowment for the Arts as part of an over-arching project entitled “Thomas Cole and the Roots of the Conservation Movement,” designed to highlight the 19th-century tradition of conserving iconic American landscapes. Additional support is provided by the County Initiative Program of the Greene County Legislature, administered by the Greene County Council on the Arts. The accompanying printed publication is supported by the Wyeth Foundation for American Art and several individual funders.